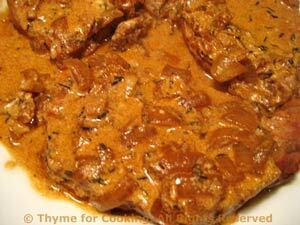 Hungarian Pork Chops, Thyme for Cooking's Healthy Weekly Menu. I use sweet paprika for these, but you could use smoked paprika, hot or a combination. If you get thick chops, add another 10 minutes or so simmering time to get them tender. Or let them simmer an hour or longer if you have the time... The flavor only improves and the pork will fall apart - both good things. Combine quinoa, herbs and stock in small saucepan. 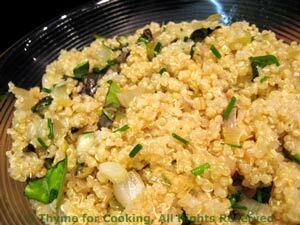 Add lemon and stir into quinoa. 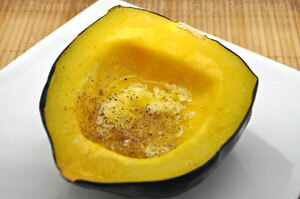 The simplest possible way to prepare acorn squash: bake, add butter and serve. You could cook it in the microwave, flesh side down, for 10 minutes, rather than roasting. Cut squash in half - a cleaver works well. Remove seeds with a spoon. Place cut-side down in a baking dish, bake for 40 minutes at 400F. Remove from oven. Put 1 tbs butter into the hollow of each squash. Return to oven and bake another 2 - 3 minutes. Remove and serve.